Because of cold weather across the state that continued well into spring, the strawberry crop is coming in a little bit later than normal. “It slowed up a little bit because of the weather, but now they’re coming up,” said Sue Gillihan, who grows strawberries with her husband, Tom, near Judsonia, Carlisle and Georgetown. 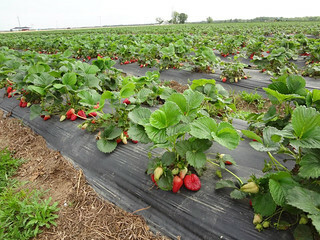 She said strawberry plants that were covered during cold weather are now producing ripe strawberries, but those that weren’t covered are coming in more slowly, which should extend the season later in the month. 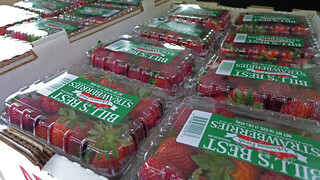 According to estimates from Jim Goodons, president of the id-America Strawberry Growers Association, about 100 acres of strawberries are being cultivated this year in Arkansas. That compares to about 40,000 acres planted in California, which accounts for nearly 90 percent of U.S. strawberry production. Much of Arkansas production is sold locally, at roadside stands and farmers markets. One place to find strawberries in metro Little Rock is the Argenta Farmers Market, which is having a strawberry festival on Mother’s Day weekend, Armstrong said. People looking to find fresh berries can also use the Arkansas Market Maker Web site, which allows them to search for both farmers markets and growers in their area. “Market Maker is a wonderful tool to help consumers find local growers and farmers markets,” Rainey said. Growers/markets not yet registered for Market Maker can also register to put their information on the site. The address is http://ar.foodmarketmaker.com/.